☢ Industry PR at its very bes, which was and still is used to help sell the uses of Peaceful Nuclear to the masses. I had to look it up. Eisenhower did kick it off in ’53. According to Wikipedia, Atoms for Peace was “part of carefully orchestrated media campaign, called Operation Candor, to enlighten the American public on the risks and hopes of a nuclear future.” Some say it was a cover for a massive buildup of our nuclear weapons arsenal. Under Eisenhower our nuclear weapons arsenal inventory rose from 1,005 to 20,000 weapons. The good thing about Atoms for Peace was its emphasis on nuclear weapon nonproliferation. Since that time very few additional countries have developed their own nuclear weapons program. It is interesting to note that we helped Iran and Pakistan back then to build their first nuclear reactors. Yes, correct. President Eisenhower. Thanks for your guesses! We cannot confirm, but it appears another commenter recognizes the location! 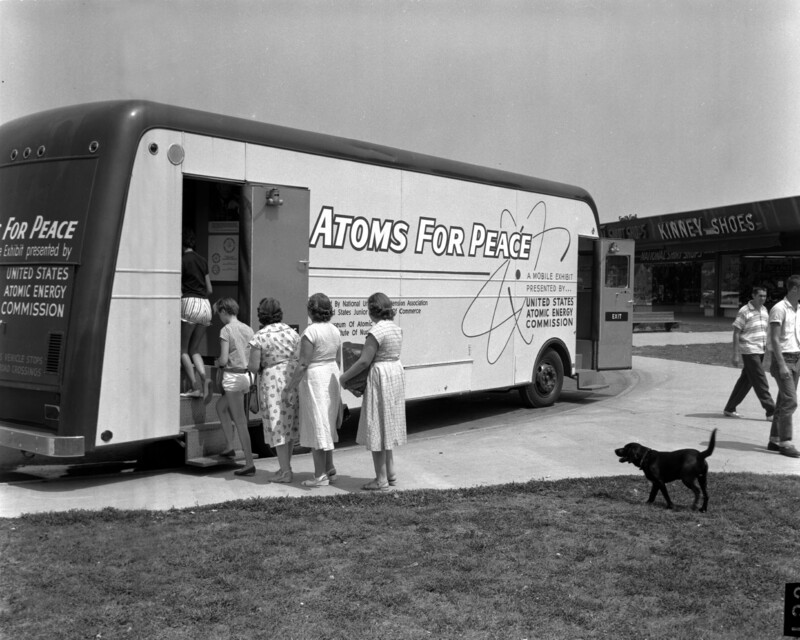 “Atoms for Peace” was the title of a speech delivered by U.S. President Dwight D. Eisenhower to the UN General Assembly in New York City on December 8, 1953. My recollection is that it was Eisenhower. The photo location appears to be the shopping center in Oak Ridge, TN. Can you confirm? I recognize that Kinney Shoes store in the background as one that my parents, brothers, and I shopped in throughout my childhood there in downtown Oak Ridge where this photo was taken. During the late 50’s, 60’s, and 70’s Oak Ridge was a great place to grow up. I have wonderful memories of the first “Atomic Museum” that my Brownie Troop visited and of annual open house events that allowed us children the rare opportunity to go “behind the fence” and see where our parents worked. Next Next post: REFRESH: 2.802 vs. 2.206 — What’s the Difference?